New Book on Kierkegaard’s Epistemology! by M.G. Piety.In Publishing News, Resources for Kierkegaard Scholarship.3 Comments on New Book on Kierkegaard’s Epistemology! 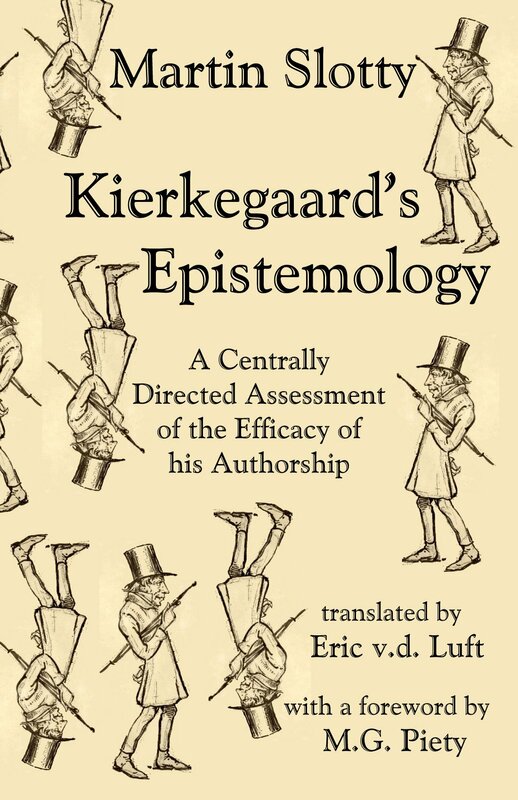 Martin Slotty’s book on Kierkegaard’s epistemology is now available in an English translation! This is great news for Kierkegaard scholars because until now, there was only one book available in English on Kierkegaard’s epistemology, my Ways of Knowing: Kierkegaard’s Pluralist Epistemology (Baylor, 2010). Slotty’s book is an introduction. It is shorter and more accessible than Ways of Knowing, so it is the better volume to start with for those who want to understand something about Kierkegaard’s epistemology. Kierkegaard scholars should read both, of course, because, as I argue in Ways of Knowing, Kierkegaard’s epistemology provides the foundation for his views on the nature of faith in general and religious faith in particular. So far, Slotty is available only in paperback. I understand from the publisher, however, that there will soon be an ebook version! I was honored to be asked to do the foreword to Slotty’s book. What follows below is the first part of the foreword. I had written the first draft of my dissertation on Kierkegaard’s epistemology before I stumbled upon this little book in one of the “hollandsk bogauktioner” that are held in Helligåndshus in the center of Copenhagen every summer. These “Dutch book auctions” are huge used book sales where individual antiquarians get rid of what is effectively their overstock. All the books are priced the same and the price is reduced by half on succeeding days. These sales are mana from heaven to a poor graduate student trying to build a collection of nineteenth-century Danish philosophy and theology on budget. The books are generally inexpensive to begin with but become even cheaper with time. I went generally looking for works by Kierkegaard’s contemporaries, figures such as Hans Lassen Martensen, and Poul Martin Møller. The only way I could find such works, however, was to pore over the titles of each and every one of the thousands of books on the many long tables laid out in the medieval annex to the famous old Helligånds Kirke (Church of the Holy Spirit). I found quite a few invaluable reference works this way, including the famous Ferrall-Repp A Danish-English Dictionary from 1845. No find was more important to me, however, than this little book by Martin Slotty. I couldn’t believe my eyes when they landed upon a slim volume, that appeared to date from the turn of the century, with the title Die Erkenntnislehre S. A. Kierkegaards. Someone other than Anton Hügli had actually written a book on Kierkegaard’s epistemology, and that long ago! The book, as it turned out, was Slotty’s Doktorarbeit for Friedrich-Alexanders-Universität Erlangen. It isn’t nearly so deep-going an analysis of Kierkegaard’s epistemology as Hügli’s Die Erkenntnis der Subjektivität und die Objectivität des Erkennens bei Søren Kierkegaard from 1973. It’s an introduction to Kierkegaard’s epistemology, as is clear from the title. In fact, it is comprised primarily of passages extracted from Kierkegaard’s works with only the occasional addition of an analysis of their meaning. The relative paucity of analysis is explicable, however, by the fact that the passages more or less explain themselves. That is part of what makes the book so important. It shows very clearly that one does not have to dig deep to see that epistemological concerns were central to Kierkegaard’s thought. Peter Brown, paraphrasing the view of Byzantine scholar Averil Cameron, wrote in a recent edition of The New York Review of Books that “Byzantine studies should be put into a sort of intellectual receivership.” It’s an “undertheorized field,” he continues, quoting Cameron, “as well as an understudied one” (NYRB, December 18, 2014). I’ve often felt that Kierkegaard scholarship should be put into intellectual receivership. There is plenty of work being done on Kierkegaard, of course, and much of it is highly theoretical. That isn’t the problem. The problem is that while there is excellent work being done on Kierkegaard, Kierkegaard scholarship as a whole still suffers from some fundamental misconceptions about just what kind of thinker Kierkegaard was. Most people writing on Kierkegaard today do not have even a passing familiarity with the Danish language, let alone a command of Danish that would allow them to read Kierkegaard’s works in the original. Scholars tend to focus on a select few books, which, read in isolation from the much larger authorship of which they are a part, are difficult to interpret.1 This little book will provide a necessary corrective to the view that Kierkegaard was a proponent of irrationalism or subjectivism, as well as to the view that epistemological concerns did not figure largely in his works. They did. 1. It is worth noting that nearly all Kierkegaard’s contemporary readers would have been familiar with his whole authorship. The number of Danish intellectuals was relatively small and works of the sort Kierkegaard published were not numerous. Also, the device of pseudonymity did not conceal the origin of Kierkegaard’s works for very long. Copenhagen was, and remains, a small town. In a way a bit parallel to finding Ferrall-Repp, an english translation of an 1845 Danish “concept of dialectic” would be my dream find. I don’t suppose you would know of such a work, would you? Few words occur more frequently in the translations of Kierkegaard’s works and few are more foreign to my foundational education. I don’t know of any work from that period specifically on the “concept of dialectic.” Meyer’s Fremmedordbog (dictionary of foreign words) from 1853 is very helpful, though. Meyer defines “Dialektik” as “Samtalekunst” (i.e., literally, the “art of conversation”), but also as Fornuftlære/Tankelære/Logik (literally, “study of reason/thought/logic), and Sandsynlighedslære (study of probablity). I could go on, but I think instead that I will simply do a post on this concept. Thanks for bringing this issue to my attention! I cite (or “blame,” as if guilt were more effectual as it is in some) your blog essay as my point of entry into puzzlement. Thus I justify this intruding petition for feedback. I am admittedly an English-only Kierkegaard nut with no relevant credential. I also hope for mercy as might be afforded a freshman in Philosophy 101. Question 1: Could an author be discovered who applied/emulated Ferrier’s epistemology to examine Kierkegaard’s thought? 1)	“Epistemology” seems to appear far more frequently in the scholarly apparatus than in a translated text of Kierkegaard’s words. 2)	I was surprised to learn that the word “epistemology” was first introduced into English so recently … within Kierkegaard’s lifetime (1854 by James Frederick Ferrier). 3)	While awaiting Slotty being delivered, I began Ferrier’s Institutes of Metaphysic (a free Google Play eBook). 4)	Ferrier’s lifetime and authorship compassed Kierkegaard’s. I have no reason to think either influenced the other. 5)	Starting from Ferrier’s Proposition 1, I perceive a resonance with my knowledge of Kierkegaard. 1)	Slotty is unavailable for inquiry, and I find him quite opaque in contrast to Ferrier. 2)	Beer budget; champagne taste. New Book on Kierkegaard's Epistemology!